tragedy | Dragons Rule OK.
Cyrus Street returns to the town where he grew up. He returns to try to solve a mystery that had ruined his life. 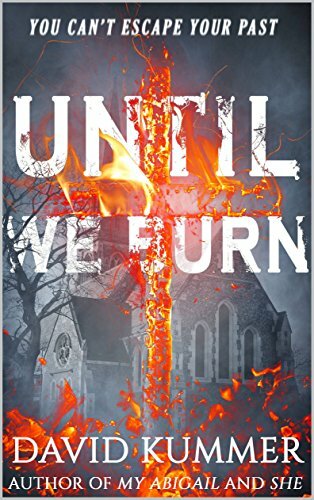 15 years previously, the church in the town had burned down, killing, amongst many others, Cyrus’s young son. The fire had been arson, and he wants to find out who did it. Helped by a young man from the town, he sets about trying to find clues as to the perpetrator of the crime. This becomes more important as murders begin to take place in the town, seemingly of people who were witnesses. Cyrus’s probing has worried someone. David Kummer is a very talented young author. I found I couldn’t put the book down once I’d started it. He manages to grip the author and carry them along with him. It is a dark story, described as ‘psychological horror’, and I would go along with that description. David Kummer has an insight into character unusual for one so young. His characters are real, and have both flaws and virtues. We find ourselves sympathising readily with them. The ending is surprising. I thought I’d guessed the perpetrator, but I was wrong. If I have a fault to find, it’s that at the end, we know who, but not why. There are also a couple of places in the book I was unsure about what had happened, but this did not spoil my overall enjoyment. This is a young man to watch. I make no apologies for re-posting this poem. I wrote it 2 years ago to commemorate the anniversary of the start of World War One. As July 1st is the 100th anniversary of the terrible battle of the Somme, I thought I’d post it rather than the next episode of The Wolf Pack. That I’ll post next week instead. My Great Uncle Jim, whom I mention in the poem. came back too, but he died shortly afterwards from the results of gassing. The lady known as Auntie Polly, who was his fiancee at the time, never married, but the family always treated her as though they had been. ‘Our Poor Willie’ was also my great uncle. He was my maternal grandmother’s brother. She always referred to him as ‘our poor Willie,’ but no one ever knew why. I make no apologies for this poem not being in the modern idiom of no rhymes and little rhythm. I’m old-fashioned enough to think that poems ought to differ from prose, and many modern ones I’ve read are little different. That doesn’t necessarily mean rhyming though. I’ve written blank verse myself on occasion. I also think that they ought to be comprehensible! Please leave a comment in the comments section. This is the last part of the story of Carthinal’s parents. I hope you enjoy it. Please leave a comment when you’ve read it. Two years passed quickly, and Carthinal was toddling about. Noni came in from the embassy where he was still working. It was Carthinal’s second birthday and he had brought a huge toy dog for the little boy. ‘Dada,’ Carthinal said as he ran towards his father. Noni gave him the dog and he struggled with it, dragging it towards the sitting room where he had been spending some time with Jovinda. His mother laughed at his difficulty, then went to help him bring it in. ‘Say thank you to Daddy, Carthinal,’ Jovinda said. Jovinda smiled up at her husband and picked up her son, dog and all. She kissed him as he struggled to get down again. ‘Down,’ he insisted. He clenched his small fist and tried to punch her. ‘Down’ he repeated. Jovinda put him down and sighed. The couple wished for another child, but the years passed and there was no sign. Noni said it was probably due to the infertility of elves and that perhaps it would happen in due course. Jovinda went to the temple of Bramara and prayed, but it was to no avail. When Carthinal was six, he was in the garden, playing on a swing that Kendo had fixed to the branch of a tree in the garden. He heard his nurse calling for him, but took no notice. It was nice in the garden. The sun was shining and he liked the swing. Shortly, Jovinda came out and saw him. The little boy’s face clouded over and he fixed his lips into a straight line. ‘No.’ His eyes began to look, not like the blue summer skies, but dark stormy seas. Jovinda noticed the change ans she went and picked him off the swing and carried him, squirming and crying into the house where she handded him over to Blendin who took him away for his tea. Jovinda went into the sitting room and smiled to herself. She had become used to these infrequent outbursts of temper and knew that in a few minutes her son would be his normal sunny self again. His temper never lasted long. Noni arrived soon after this and sank down in one of the chairs. ‘The father told the midwife that the first child was to be called Frissillimidor and the second Grimmshollin. She claimed she knew in which crib she’d put each baby and so they were named.’ He stood and walked round the room before continuing. Noni came and sat beside his wife and took her hand. Jovinda turned and looked at her husband, understanding beginning to dawn on her face. Just at that moment, Carthinal came to the door, but neither of them saw him. He had come to apologise for his outburst earlier. He heard his parents arguing. He had never seen that before and it frightened him. Nevertheless, he stood just behind the door and listened to an argument he could not understand. Carthinal fled back up to the nursery, his apology forgotten. No matter what argument she put forward, Noni was adamant he must go to fight for the rightful heir. The couple went to bed that evening barely speaking and that continued until three days later when Noni had packed ready to leave for the Elven lands. Jovinda said goodbye to Noni with a heavy heart. They had made up their quarrel and she stood on the doorstep of their house with Carthinal as she waved him off. She blinked back her tears as she stood waving until he could no longer be seen. ‘How long will Daddy be away?’ Carthinal asked. Two years passed. Noni came home as often as he could, but he needed a long leave to make the journey to Bluehaven from Rindissillaron and back and he had little time when he was there. Jovinda had to rely on his letters to tell her of the progress of the war.In one letter, Noni wrote of how the war was nearly won. Grimmshollin had retreated to a very small area and was barely holding it. It would be only a few days before the war was over. Jovinda was delighted at this news and eagerly looked forward to welcoming Noni home. Every day she expected a letter, or even Noni himself to arrive. The letter came in just over a sixday saying that there was one more battle to end the war and then just a few things to sort out before Noni came home. She was ecstatic and began to prepare a welcome home party. A couple of sixdays later, there was a knock on the door. Their butler answered and showed an officer into the drawing room where Jovinda sat reading to Carthinal. She rose as the officer entered. He saluted and introduced himself as Roshinderal, who was Noni’s friend. The young captain cleared his throat and looked embarrassed. ‘Perhaps you’d better send your son out of the room, Madam,’ he said. ‘Please, sit down,’ said Roshinderal, as though it were his house and she were the visitor. Jovinda sat down as requested, heart sinking. Then Roshinderal cleared his throat again and began to speak. Jovinda’s hand went to her mouth. Roshinderal took Jovinda’s hand in his. Jovinda looked at Roshinderal with a blank look in her eyes. All the life had gone out of them. Then she screamed. ‘No! No! No! No! It’s not true. You’ve all made a mistake. He’s not dead. He can’t be. Go back and check. I’d know if he was dead. I know I would.’ She shook her head in disbelief, refusing to accept what Roshinderal had told her. Her screams brought the butler, who was passing the door. Between them, they decided that Jovinda’s parents would be the best people to get and so Roshinderal set off to their house to get them. As soon as they arrived, they took Jovinda and Carthinal, along with Blendin, his nanny, back to their house. Ellire took Jovinda and put her to bed in her old room with a soothing drink and soon she was asleep. Jovinda remained in her room for the next few days. She refused to answer the door, so Ellire left a tray outside. Some days a little of it disappeared, but others Jovinda did not touch it. Ellire tried talking to her daughter through the door, but got no response. She tried to get her to come out to see Carthinal who was wondering what was going on. The six-year-old understood that his father had been killed in the war and had been inconsolable for a few days, but then, in the way of children, he seemed to bounce back somewhat. He could not, however, understand why his mother was ignoring him. Ellire tried to tell Jovinda this, but either the young woman did not hear or she was still too much enveloped in grief that she did not care. Three days passed and Jovinda had not responded to anything. The trays of food and drink had been left untouched and no sounds came from her room. No sobs, no crying, no prayers, nothing. Kendo decided that he would go in. After all, no one could go without food and drink indefinitely, especially drink, and Jovinda had not drunk anything in three days. He knocked on the door. No sound from inside. He tried the latch, but the door was locked. Still nothing. Kendo put his shoulder to the door and pushed. There was a cracking noise as the hinges gave way and he fell into the room. What he saw there broke his heart. There was his daughter, swinging from the beams overhead, a belt around her neck. He quickly cut her down, but it was to no avail. She had been dead for quite some time. A couple of days probably. He left the room and told Ellire not to go in and to keep Carthinal away. The boy had taken to sitting outside his mother’s room talking to her through the door, even though there was no response. He went out into the garden and sat under a tree thinking. Was there something he should have done? He ought to have broken the door down sooner. They should have insisted Jovinda come out and eat her meals with them. She was obviously brooding in there alone. All these thoughts went through his head until he felt he was going to go mad. The funeral was held in the temple of Kalhera a few days later. The family was surprised at how many people turned up. Jovinda and Noni were popular figures in Bluehaven. Kendo knew he would never get over his guilt about his daughter’s death, but he buried it deep. He said to his wife after the funeral, when everyone had left and Ellire was weeping softly to herself. Thus Carthinal lived with his grandparents and they brought him up. No one ever told him how his mother died.